Six months after Haiti’s January 12 earthquake, MSF describes the organization’s largest ever emergency response. 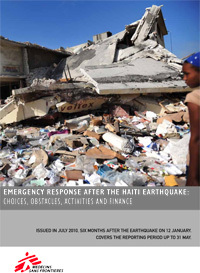 Six months after the earthquake that devastated Haiti on 12th January 2010, this report describes the evolution of MSF’s work during what is the organization’s largest ever rapid emergency response. It attempts to explain the scope of the medical and material aid provided to Haiti by MSF since the catastrophe, but also to set out the considerable challenges and dilemmas faced by the organization. It acknowledges that whilst the overall relief effort has kept many people alive, it is still not easing some of their greatest suffering. MSF had been working continuously in Haiti for 19 years prior to the earthquake, providing a wide range of medical care from maternity services to physiotherapy and mental health programs. From this long term involvement, the organization knew that the health system was out of reach for the majority of Haitians. There was a lack of trained medical staff across many disciplines, from physiotherapy to psychiatry. The country was totally ill-prepared to deal with the medical consequences of such a calamitous natural disaster. The earthquake destroyed 60 per cent of the existing health facilities and 10 per cent of medical staff were either killed or left the country. 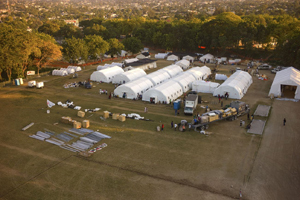 MSF had to relocate services to other facilities, build container hospitals, work under temporary shelters, and even set up an inflatable hospital. With over 3000 Haitian and international staff working in the country, MSF currently manages 19 health facilities and has over 1000 beds available at various locations. The organization has provided emergency medical care to more than 173,000 patients between January 12th and May 31st. MSF was overwhelmed by the generosity of people around the world providing financial support for the organization’s response in Haiti. By the end of May, MSF had received over 91 million euros specifically for emergency relief there. Well over half of this money – some 53 million euros – was already spent in the first five months following the disaster. Our current budgets foresee that around 89 million euros will have been spent on direct assistance to the earthquake victims by the end of 2010. Six months on, the medical provision for the majority of citizens has been significantly improved in general and some poor people who were unable to access healthcare prior to the disaster are now able to receive care. However, the sustainability of this situation depends on continuing international commitment and the question of ensuring quality remains. Shelter remains the most urgent need, with reconstruction moving at a very slow pace and the rainy season compounding the misery. Poor Haitian people are entirely used to limited comfort and resources but MSF staff there report that frustration and anger are rising because too little has changed in the living conditions since the quake. The disaster in Haiti was such an intense blow to a poor and densely packed urban population that it presented new challenges of scale and complexity on every level for the relief effort. Although MSF was in the country before the earthquake hit, the organization was stretched to its limits by the urgency and extent of the medical needs. The organization’s financial resources were generously augmented by millions of individual donors, but the sudden pressure on its medical, technical and managerial staff was unprecedented. The report sets out the ways in which those people, the Haitian and international staff, struggled to answer the challenges thrown up by the earthquake. They know that the response could never be sufficient, that even the core medical action in the early days was overwhelmed by the suffering. And that the wider need of the Haitian people for the restoration of some dignity and hope to their lives has been painfully slow to be realized. The dust laid down by the thousands of buildings that were crumpled and split by the huge tremors in January has now been washed into pools and gulleys in the streets of Port-au-Prince. The rains that were the next threat to the survivors have been falling for weeks and the predictable misery for the hundreds of thousands without homes is now relentless. And it will likely get worse as what is expected to be a bad hurricane season looms on the horizon. Many people who escaped from the falling buildings six months ago are still too afraid to seek shelter in the ruins. They remember the after-shocks and have heard the scientific gossip about more quakes to come. They huddle under the flimsiest tarpaulin or tent, chase and recover them when they get blown away, and stay with their new neighbors in the straggling city settlements. From the air, Port-au-Prince has ragged lakes of tarpaulin blue. There is protection against the sun and showers but not tropical downpours or cyclones. The relief effort has kept the people alive but it is not easing some of their greatest suffering. The conditions of life are raw and levels of frustration are increasing. The level of violence in Port-au-Prince is a permanent concern. Before the earthquake, MSF was treating people with bullet wounds and victims of sexual violence in Martissant and Trinité. Beyond these important medical needs, the generalized insecurity requires special attention. However, MSF’s medical data do not show an increase in the number of victims of violence after the earthquake. The overall figures for five months show 2,147 patients treated for violence related trauma and another 264 for gunshot wounds. Today, the medical provision for the majority of the citizens has been substantially improved since the quake and in some respects is better than before it. Numbers of poor people who before the disaster were effectively excluded from the public and private systems are now able to get attention. The range of medical care in new, temporary structures and in some of the surviving hospitals and clinics is substantially greater and nearer to the people, although issues of quality remain. The concern is that so much of this depends on a continuing international commitment and there are real questions about its sustainability. The Ministry of Health has a plan for the next 18 months that has free care for some vulnerable groups at its core. But all this needs external funding and the reconstruction of lasting facilities. The private sector, which has always been significant in Haiti, was badly hit too and is struggling to recover. The other constraint is the lack of trained professionals. The earthquake destroyed 60 per cent of the health facilities and 10 per cent of the medical staff were either killed or left the country. Haiti has always exported talent and those who survived the quake are still heading abroad. The availability of food and water has also improved substantially since the quake, although for most people it is still less secure than in their lives before. The massive World Food Programme distributions were effective and although there is concern whether they reach all of the most vulnerable groups in the communities, MSF has not seen evidence of growing malnutrition. The water issue is less clear because the free distribution in the first three months has been changed to a charge system, which complicates non-charging relief distributions like MSF’s and puts a strain on so many people without jobs and income. The concern here is that this is not something that MSF specializes in, it is not a core medical activity and the organization’s resources are being stretched because of the lack of response from other providers. Similar concerns apply even more forcefully to the sectors of sanitation and shelter. In sanitation provision there have been improvements since the dire conditions shortly after the quake, but in some communities like Cité Soleil or the camps of Carrefour Feuilles, MSF is one of very few organizations with a presence. MSF is playing a role with latrines, waste disposal and hygiene provision in many other parts of the earthquake affected area, which often goes well beyond the standard work at the medical facility and the surrounding community. At the same time there are big challenges that are not being resolved by the wider relief and reconstruction effort. There is just one waste dump for the city, which is full to overflowing. No alternative has been decided on and the rainy season is compounding the problems of access and pollution. Large parts of the city are at sea level, so latrines should be emptied very regularly. They are not. In the camps, the inadequate provision adds to the likelihood that heavy rains will wash sewage through the living areas. By far the biggest threat to people’s living conditions is the failure to provide any substantial, robust shelter. Sheeting and tents were never anything more than a very temporary solution. They have a life expectancy of around six months. MSF itself distributed significant quantities of tents but some form of reconstruction should have begun in June and July so that people would then be able to move into at least semi-permanent shelters. Very little of this has happened. Decisions about land allocation have been very slow. The tents are starting to deteriorate and the rain is exposing the problem. Even without a hurricane, the wet season will be enough by itself to complete the misery of the people caught in the open. 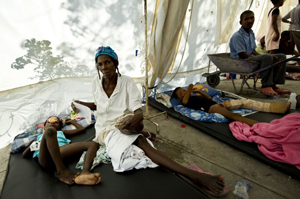 MSF has focused a very substantial part of its global resources on Haiti in the last six months. The peak of that emergency phase activity was around the two-months mark, when some 350 international staff were working there. They were needed because it took longer than usual to find and recruit all of the Haitian staff to run the massively expanded medical projects. At its peak in March there were 26 separate facilities – a number that included hospitals, rehabilitation centers, and general medical centers. Following the consolidation of some of these facilities and a shift in priorities, MSF now manages 19 health structures. MSF also runs 16 operating theaters and has more than 1100 beds available at its various locations. Overall, since the earthquake and up to 31 May, MSF has provided medical care to more than 173,000 patients and performed over 11,000 surgical operations. This report records some of the thinking that went into choices made around strategy and deployments. It contains testimony from staff and patients who have seen the different faces of MSF’s work. It sets out the ways in which MSF is spending the generous donations it received from so many people around the world and it sketches some of the ways that the organization is committing itself to the future of medical action in Haiti. But first, this report looks at the past, the long history of MSF in Haiti and what it tells us about the fragile condition of everything even before the disaster. When MSF began its continuous presence in Haiti in 1991, the emphasis was largely on rehabilitation of hospitals and health facilities that were crumbling and unsanitary. The work was accompanied by training for surgeons and anesthetists. There was some direct medical action through surgery and a considerable amount of water and sanitation provision around the hospitals but the majority of MSF’s engagement was in supporting a very under resourced and fragile health system. There were also periodic emergency responses to floods and hurricanes. That began to shift after 2000 when the first attempts started to reduce maternal mortality in one of the health districts. This marked the beginning of what has been an ongoing commitment to maternity and obstetric care. But the big evolution of MSF’s work happened as the country descended into political turmoil and violence in the middle of the decade. In 2004, MSF opened a surgical project in Port-au-Prince that is still running in a new setting of Trinite Trauma Centre, the only comprehensive emergency treatment facility in the country. Wound treatment became vital for a constant stream of casualties from street fighting. MSF was located at the heart of the violence in the capital when other organizations had left. Between 2005 and 2007, MSF worked in Choscal hospital in the slum of Cité Soleil as fighting went on between armed gangs and the UN peacekeeping forces. The lack of emergency care in the public health sector and the surge in violence led to the establishment in 2006 of the Martissant emergency room and mobile clinics in that slum area of the capital. In the following year, MSF increased its capacity to work with the victims of sexual violence when it opened the Pacot Centre. That facility also provided rehabilitation with physiotherapy and psychological care. At the same time, extreme levels of maternal mortality combined with frequent sexual violence brought MSF to deliver emergency obstetric services in the Jude Anne hospital in Port-au-Prince and later on in Maternite Solidarite. New peri-natal services were also started, along with voluntary testing and counseling for HIV. And Haiti’s frail infrastructure is constantly exposed to savage natural disasters. 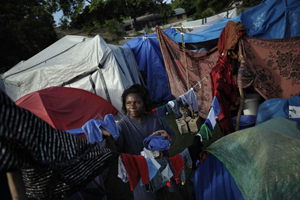 In 2008, the northern city of Gonaives was flooded by a hurricane and MSF worked there for several months in an 80-bed hospital and running mobile clinics in the camps where people had to subsist in temporary shelters. The main lesson of those 19 years work in the country was that for the majority of Haitians, the health system was almost out of reach. 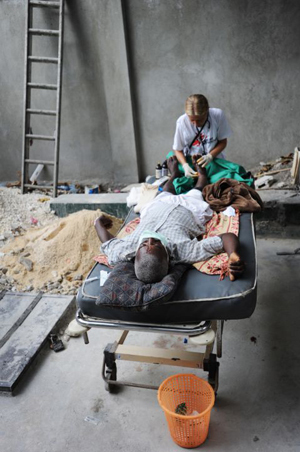 In Port-au-Prince, many of the poor have been highly dependent on MSF’s free emergency services. Fees charged by the public and private health facilities made care unaffordable for most people. Public hospitals and clinics were often plagued by management problems, strikes and shortages of staff, drug and medical supplies. Patients could be turned away because the hospitals were full and they had to abandon treatment when they ran out of money. One of the clearest statistical indicators of this poverty of care is in the life expectancy for women. It is estimated at 58.8 years. And with maternal mortality at 630 deaths per 100,000 – 50 times the rate in the United States next door – giving birth can be more than hazardous. 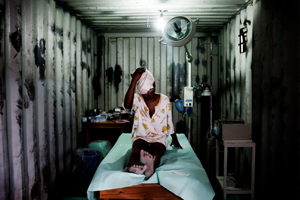 The shocking truth of MSF’s experience as a major medical and humanitarian organization in Haiti is that even without the risk of violence, Haiti’s people are exposed to life threatening suffering and neglect. The country could hardly have been less well-placed to deal with the huge additional demands that a natural catastrophe would place on its medical resources. 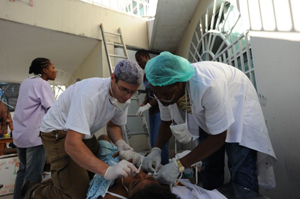 Dr Hans Boucher, the Haitian medical director at MSF’s Maternite Solidarite Hospital in Port-au-Prince, was one of the first to respond to the quake. “I was in my office when the computer screen suddenly fell to the ground. All of sudden I saw the building shake. When I got outside, I saw the walls crumble, crushing cars in the courtyard and that’s when I understood the whole building was collapsing. I noticed then that a lot of people were lying on the ground. So I called another doctor over, and both of us went over to check on these people lying on the road. That’s when we realized they were all dead. They were the street vendors who were working in front of the hospital grounds. Then I went back into the hospital to evacuate the other patients. 70 or 80 patients needed to be evacuated so we got them all out – it took us one hour and a half to get all the patients evacuated from the building. We had them lie down on mats in front of the hospital where the logisticians had quickly set up three tents to shelter the patients. We treated the injured who arrived at the hospital gate. We spent the entire night treating people, bandaging them, we were working as quickly as possible because there were so many injured people in the front courtyard of the hospital. When I realized what was happening, the first thought that crossed my mind was that my children must be dead, because at the time of the earthquake (5 pm) my children are usually home. I was wondering if I had the courage to go home to find out what had happened to them. There was no way to reach them because all the phone lines were down. So I had to make a choice at that point: I could stay and help the injured who were pouring into the hospital compound or go home not knowing who I would find. Dr Hani Fares was in his MSF office, without any medical facilities, in another part of town. He is a surgeon and a medical coordinator for MSF. “For a whole minute it felt like the ground was moving on water. I was alone in the office, and I think the first thing in my head was that it had to be an earthquake. Maybe it’s because I’m Egyptian, and we had an earthquake in Cairo in 1992, so I recognized the feeling. So I got myself out of the office fast and went outside, where I found the other staff. People began to arrive on foot at the office, more and more of them, and I had to decide what to do with them all. That’s when I first heard the rumor that many of the hospitals in Port-au-Prince had collapsed. We started to get the picture, and realize: yes, it’s big; in fact it’s a catastrophe. My problem was that I didn’t have any drugs to give them. But I went next door and found some boxes with just enough drugs in there to help me, and I took them back to the office. Then I started to see patients, pregnant women with a lot of fractures; serious wounds; head trauma; open fractures. Initially I covered the wounds with antibiotics, and gave the patients painkillers to relieve the pain - I had found some injectable diazepam and morphine and antibiotics in the box of drugs. The Haitian colleagues were an enormous help to me. During those first two hours, they were really fantastic: they were all afraid, and worried about their children and families, and yet not one of them left – all of them stayed and helped me. I think we had eight people who died. Most of them there were serious head trauma cases. One frustration was when there were cases of subdural hematoma – when blood pools under the scalp. With a small machine you can make a hole in the bone to let the blood out and save the patient, but I didn’t have the machine. As those first terrible hours were unfolding, the initial connections were being made with the wider MSF network outside the country and the emergency managers who would have a vital part to play in steering the overall response. This section of the report looks at the way that response was handled, the strategic choices that were made and the factors that challenged the effectiveness of MSF’s work. As the news broke, the 19 years of history in the country were among the most important assets for the organization. They allowed for a much more rapid, better informed reaction and the battered teams in the country were the base for the medical action. But the first hours were still clouded by poor communication because contact between the teams on the ground was limited. In the MSF offices in the USA and Canada late that Tuesday afternoon and in Europe in the early hours of the morning of the 13th January, staff were trying to interpret the patchy information about damage levels and the impact on MSF facilities. The first decisions that day were based on experience of earthquakes elsewhere and the certainty that Haiti’s limited medical capacity would have been completely overwhelmed. There was word that MSF’s hospitals were badly hit and that staff were struggling to rescue patients and colleagues. Many staff could not be accounted for and one international staff member was trapped under the rubble of their house. The final toll was that four Haitian colleagues were killed, along with four more who had worked with MSF until shortly before the quake. Quick decisions were taken about supplies and extra staff. It was clear that the top priority had to be materials for surgery, along with the extra surgical teams, and shelter materials to rig new facilities by the damaged hospitals. A whole inflatable hospital was rushed to an airport in France to add operating theaters and beds. Medical needs were brutally obvious: life saving surgery and wound care. The plan was to get pairs of surgeons and anesthetists to rotate and work around the clock in as many theaters as could be reclaimed or erected. On that first day, estimates of the numbers of injured were rising fast and medical orders for dispatch were multiplying. MSF had a plan for emergency responses to widespread violence in Haiti and it was being rapidly adapted to this massive disaster. The pressure was mounting on the logistics staff to charter planes and find routes into Haiti. The first team for reinforcing MSF staff already in the country arrived 48 hours after the earthquake but there were serious struggles to get landing slots in the damaged and congested airport at Port-au-Prince. In the first 6 days, out of 17 flights with vital supplies and staff that MSF intended to reach Port-au-Prince, 9 cargo and two passenger planes were diverted, usually to the neighboring Dominican Republic. The consequence for the patients was that many of the medical staff and their supplies had to come by road, which added around 36 hours to the journey. Half of the inflatable hospital with its 100 beds and three operating theaters had to come that way. MSF protested publicly to the US authorities who were running the airport and access did improve but there was real concern about the impact the diversions had on the emergency care that was so urgently needed. Even so, some MSF planes did arrive early on from the logistical base in Panama and the Santo Domingo transport hub was soon consolidated as an additional access point. Restoring and expanding surgical care was the key for the staff on the ground, who were searching for new buildings in the first few days that could be used for operating theaters. One was identified in Carrefour hospital, where the theater could function, although the patients were kept in tents outside on the street because everyone feared new tremors. Another team re-established MSF in Choscal hospital in the slum area of Cité Soleil where it had worked some time before. The choices were not always able to be made on the basis of clear information about alternatives. Further down the street there might have been an even better building but the teams took what was good enough. In Choscal, the decision was made as much because MSF’s strong reputation in a potentially dangerous area allowed the organization to work in a community that might not otherwise have seen aid workers. In another location, beside the collapsed Trinite hospital, MSF surgeons were working in a container. Nobody thought that was best practice because hygiene conditions were hardly as they should be in operating theaters but the alternative was not to treat seriously injured people. On the staffing side, the impact of the quake on the Haitian staff was particularly difficult. Many of them had lost family members or homes but still carried on working. More international staff were also needed to come in to replace the exhausted workers during the first week. Recruitment internationally was dramatically successful as hundreds of people put themselves forward as emergency cover. The limitation for the organization was more in the managerial challenge of handling the swelling teams and the multiplying project locations. Outside Port-au-Prince, the decision was taken early on to head for some of the other badly affected towns. Within the first week, MSF was in Leogane to the west of the capital and even closer to the epicenter of the earthquake. The team set up a central surgical unit and ran mobile clinics along the road to Grande and Petite Goave. In Jacmel, to the south, another hospital was identified. But here the first journeys had to be made by helicopter because the road was so badly damaged. That resource continued to have value to search for remote communities whose restricted access to healthcare had become even more limited and who had seen no aid even two or three weeks into the emergency. Mobile clinics and deliveries of household items and shelter were then organized. One of the constant challenges for the management of the work was in trying to anticipate and plan for the emerging health needs. To begin with they were obvious and overwhelming. And one of the preoccupations for the medical staff was the need to find specialist treatment for complex cases like spinal injuries, cranial surgery or multiple fractures. The solution was to refer them to hospitals in Santo Domingo by helicopter. In the early days in Port-au-Prince, the normal MSF practice of outreach into the communities to find new patients was sometimes suspended as they were coming in such great numbers to the hospitals and clinics. The standard local security procedures of a ban on night driving were suspended for the first two weeks because of the clinical pressures. The surgical priorities did begin to shift though from life saving to limb saving. Doctors in the emergency facilities had always been faced with very difficult decisions about how to save badly damaged limbs and amputations were sometimes necessary to preserve the life of the patient. The second wave of surgical cases saw arms and legs which had infected wounds but where life was less immediately at risk. By then the surgical capacity was significantly expanded with the presence of the inflatable hospital with its three operating theaters. That phase of the medical work had been preceded by an explicit strategy of consolidating specialist provision for dialysis for crush injuries and to expand emergency obstetric care. This had always been an MSF core activity and it became a major part of the life saving capacity. Psychological services were also very much integrated into the medical provision, initially as part of trauma care for badly injured people but increasingly as an outreach activity that dealt with the widespread symptoms of shock and bereavement in the communities. At the same time as the medical work was being refined and elaborated, there were parallel efforts to fill some of the large holes in the provision of water, sanitation and shelter. These are normally support activities for MSF medical projects, which involve creating the appropriate working conditions in the hospitals and clinics and providing for the patients. 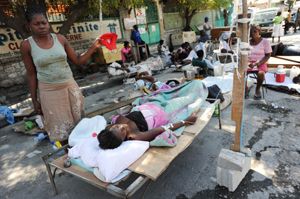 But in Haiti, the needs beyond the hospitals were huge and potentially damaging to the health of the surviving people. There was a real tension for MSF as its resources could have been pulled in all directions. The focus had to remain on securing the medical services for the patients but substantial work was done even so in camps and the facilities. Water trucking, setting up bladders and starting to construct latrines was a significant contribution to basic welfare in the settlements. Constant monitoring was going on to identify any signs of disease outbreak or epidemics, which are so much more likely in crowded conditions. Fortunately, such outbreaks are comparatively rare in Haiti. The next level of provision, distribution of shelter and non-food items like hygiene and household kits, was more problematic. The needs were – and still are – so overwhelming that MSF’s contribution to meeting them EMERGENCY RESPONSE AFTER THE HAITI EARTHQUAKE 15 could never be very satisfactory. Even so, the project managers did push the boundaries of MSF’s core medical action and organize distributions. But MSF has been disappointed in Haiti with the overall commitment to get shelter in particular to the people. The medical needs were certainly shifting by the second month and hospitals had filled up with patients recovering from their injuries. Other emergency medical teams were preparing to leave and MSF was pushing for new facilities to take the patients. That meant a shift to longer term care with an emphasis on physiotherapy as part of the recovery process. Moreover, the wider move in the second phase of the medical work was to reinforce the provision for non-earthquake related conditions and chronic illnesses. Violence related injuries needed front line care and there was growing provision for pediatric cases. So even more hospital beds had to be freed and new ones created for longer-term patients. All of this was a confirmation of the fundamental choice for MSF that it would concentrate on its strengths as a provider of quality hospital care, which was not guaranteed from other sources. At the same time, there was a determination to work in the communities to deliver primary care. Clinics in the settlements were dealing with wound dressing and minor ailments. The flow of patients to the hospitals was re-balancing to the “normal” medical work with respiratory infections, road accidents, sexually transmitted infections and chronic conditions like TB and HIV infections. By the third month there was also a consolidation of some of the medical facilities, with adjustments to take account of other organizations’ work and in response to the Ministry of Health’s needs. The staffing patterns were becoming more conventional for an MSF intervention. Recruitment of Haitian staff had greatly increased and the international component stabilized, so that the ratio came back to a historical 10:1. The earlier tendency for staff to overwork with long hours and few breaks was calmed and greater efficiency established with better staffing numbers per ward and clinic. MSF emergency managers have been looking back at the achievements and the frustrations of the early work. They feel that their preparations and plans for events like this were pushed to the limits. The capacity to respond was demonstrated but it was also close to being swamped. The financial cost of flying such a high proportion of the vital material was very high and at the beginning even that was compromised by the airport problems. But the scale of the disaster was exceptional. MSF had dealt with natural disasters where the fatalities were as high but in this case there were far more injured survivors. The nature of the buildings, the depth of the quake and the way people lived delivered a particularly cruel level of suffering. Experienced MSF workers were universally shocked by it.